Earlier this month, Red Hat organized it’s annual Summit conference in San Francisco for more than 7000 attendees. 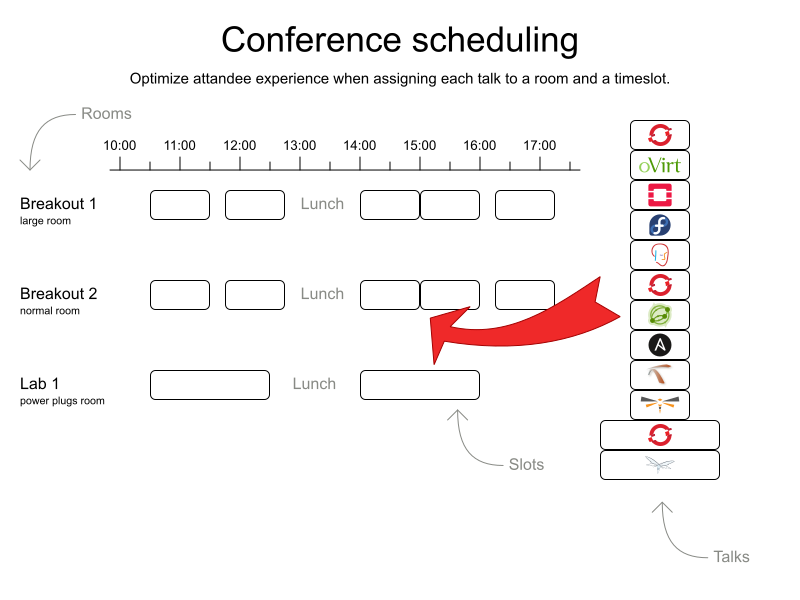 As Jim Whitehurst explained in his opening keynote, OptaPlanner optimized attendee experience by scheduling all of the 325 non-keynote sessions. Let’s take a look behind the scenes. A few weeks after the CFP closed and the program group decided which talks to accepts, Arrie Brown (master coordinator of Summit, the business expert) and me (the technical expert) started the automatic scheduling. So for everyone wondering why your brilliant talk wasn’t accepted: it’s not OptaPlanner’s fault! Instead, it had to assign a timeslot and room to each talk. So for everyone wondering why your brilliant talk didn’t get a better time: it is OptaPlanner’s fault! My own talk was on the last timeslot of the first day, from 16:30 until 17:15. Traitor. 12 years of dedication to its code and this how it repays me? Arrie created a Google Docs spreadsheet, uploaded the data from the CFP application and ran it through the OptaPlanner Conference Scheduling example. The first road bump we encountered was that OptaPlanner couldn’t find a feasible schedule. It scheduled dozens of talks in the same room at the same time. That’s a problem. Voxxed Zurich 2018, didn’t run into this problem, but it only had 1 talk type. It took us a while to figure out the cause, due to talk type complexity, the sheer size of the conference and especially the poor visualization at the time. I even got side-tracked on trying to fix the feasibility, instead of prioritizing the visualization first, for more insight into the result quality. Once I improved the visualization in the output spreadsheet, the real problem surfaced immediately: not enough pigeon holes. There were 325 talks and only 300 slots to put them in. We added the 2 missing rooms in the input data and got our first feasible solution. But we didn’t just want a workable schedule: we wanted a great schedule. The CFP application is pretty lenient. During the first import of that data into the OptaPlanner example, Arrie already fixed a bunch of data issues (such as duplicate speaker rows), to get the spreadsheet to import successfully. But not all data issues can be detected automatically. For example, it doesn’t automatically know which talks are popular and need a bigger room. Two rooms were already tagged as Large. Based on experience of previous editions, she identified 7 talks that required such a Large room. She configured their Required room tags accordingly. This kind of experienced, human input is vital to get a good schedule. Attendees should be able to see all talks that they want to see. Ideally, we’d use the mobile app data to know which talks each attendee bookmarked, but that data is only available shortly before the conference, long after the schedule is published. That’s a catch 22. Instead, we avoid scheduling talks at the same time if they cover the same theme track, sector or content, so every attendee can attend all talks on a particular topic. These 3 tag types (theme track, sector, content) are not equally important. Some conflicts (2 talks at the same time) are worse than others. There are only a few theme tracks and each talk has multiple of those, so theme track conflicts are common. Therefore, a conflict of 2 talks with the Containers theme track is less important than a conflict of 2 talks with the Kubernetes content tag. The spreadsheet defines the weight of each constraint, allowing to simulate the impact of different weights on the generated schedule. After some tweaking, avoiding content tag conflicts ended up 50 times as important as avoiding theme track conflicts. Some content tags were very common. For example, 46 talks included the content tag OpenShift. Others only appeared 2 or 3 times. 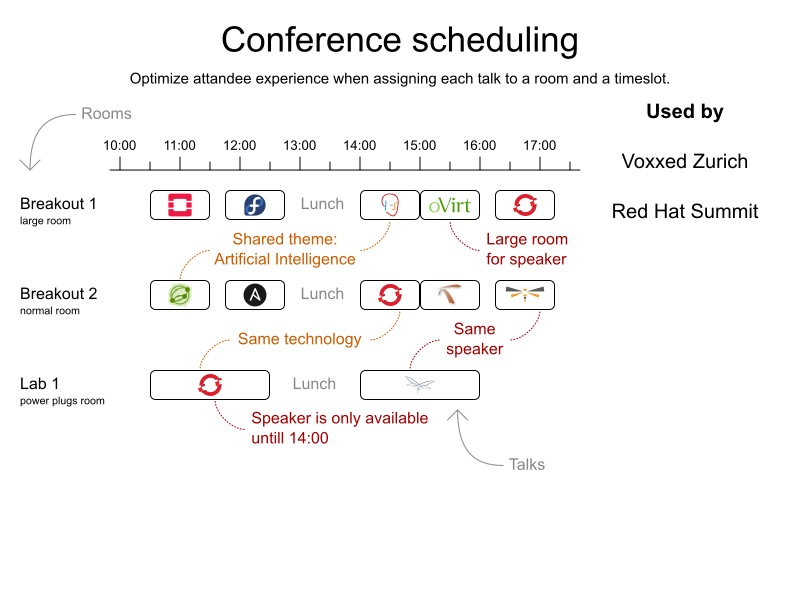 I’d now argue that a conflict with 2 (out of 46) OpenShift talks is less important than a conflict with the only 2 talks of another content tag. So for next year, we might want to normalize the impact of every content tag, based on the number of talks with that tag. There was one talk that gave us grief, at least for a moment: 2 breakout sessions that were part 1 and part 2 of the same talk. Part 2 needed to start when part 1 ended, in the same room. To proceed quickly, we just pinned those 2 session manually to a room and timeslots, before solving it. It worked. OptaPlanner scheduled all other talks while respecting those 2 pre-set assignments. Of course, if we do see more of these 2-part session cases, I 'll add a new constraint to deal with it properly. 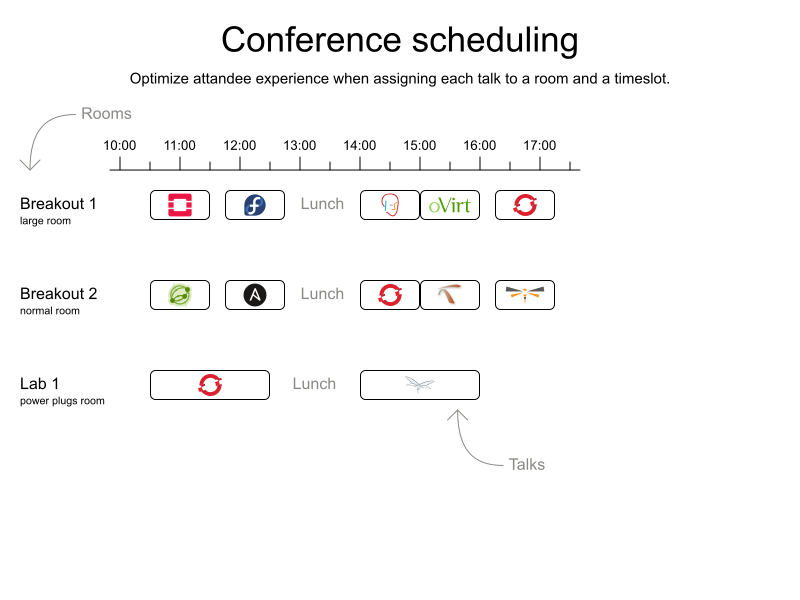 We generated a good, fair schedule with the OptaPlanner Conference Scheduling example. Similar to Google Search, we only had to define what we want, not how to look for it. Once we got the input data in a good state, we just had to press the Solve button and give it some time. Next year, we’ll be able to reuse this code. If you’re organizing a conference, take a look at the video below to try it out yourself.